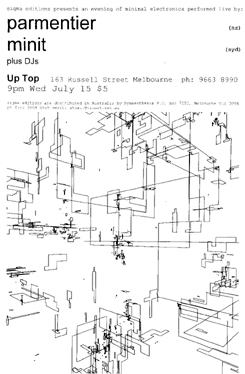 Up Top is one of Melbournes more laid-back cocktail bars, where live bands (usually jazz-oriented) and dancing are a regular feature. As a venue for an evening billed as "live minimal electronica" it presented a surpising change of pace, but its casually hip atmosphere made a pleasant alternative to the usual earnest art-spaces or grungy pubs experimental sounds are often relegated to in town. Early punters had their expectations confounded by a disarmingly eclectic collage of sounds from DJ Synaesthesia that irreverently roamed the fringes of music, from the haunting to the ridiculous. In a strange way (the music that followed being very different in character) this set the tone for the evening: music that was different, but never straining to be freakish or overtly profound. The live music that followed, from the groups Parmentier and Minit, kept up the unobtrusive, non-theatrical presence of the DJ: each hunched over their deskbound equipment, rapt in concentration, with no expressive gestures. This presence was appropriate to the music, which was ambient throughout; ambient in the original sense described by Brian Eno, of permitting a range of levels of listening attention. This was not another run-through of the two prevalent fashions in experimental electronic music-The Bass Drone That Ate The World and/or Death By 1000 Effects Pedals. Parmentier, a NZ duo formed from the remains of Thela, cannily employed the opposite of the bass drone, a high tintinnabulation that fluttered over a shifting field of deeper textures. Some old Thela fans bemoaned the demise of the bands trademark sounds of shimmering webs of guitars, but Parmentier builds upon this legacy and points it in a new direction. The celebrated flexibility of guitars can only extend so far, to the point that purely electronic sounds take over. Following this line of sonic development into electronics presents a large range of unexplored potential, without the cultural baggage (or logistical difficulties). Minit-another duo, this time from Sydney-played a set that continued the ambient feel created by Parmentier, but further flouted notions of minimalist purity in electronica. Amidst their drones and washes of sound drifted bright melodic patterns and lively rhythms, enough to encourage some late-arriving blow-ins to attempt to dance to it for a while. a being together of sounds and people". This evening at the Up Top Bar provided such an instance. Most people I saw in the bar spent their time alternating between being drawn into the subtleties of the music and being drawn into conversations with their neighbours. It was part of a pleasant (I think) trend in some recent music performances, where one wasnt obliged to rivet ones attention to the stage, yet movement and talk in the space did not unduly detract from the performance. It was music that didnt demand attention, but certainly rewarded it, and broke down the distinction between music and life. The evening also marked the launch of a New Zealand label, Sigma Editions, whose first three releases are CDs by Parmentier, Minit, and a solo recording by Parmentiers Rosie Parlaine.